Also, if a column already contains values, then the tool will set the ‘Input by’ to ‘Purchaser’ (whereas empty columns will have the ‘Input by’ defaulted to ‘Bidder’). Note that all empty (bidder-entered) columns will have the input type automatically set by the AI to ‘Currency’ or 'Number' depending on the column header. Once the import is complete, review to ensure all settings match your needs. Users can download their current bid sheet design and make the changes. Additional columns and lots (rows) can be easily added by importing them in an updated bid sheet. A log of the changes made for each import is presented before the data import is finalized, as shown in Figure 2. 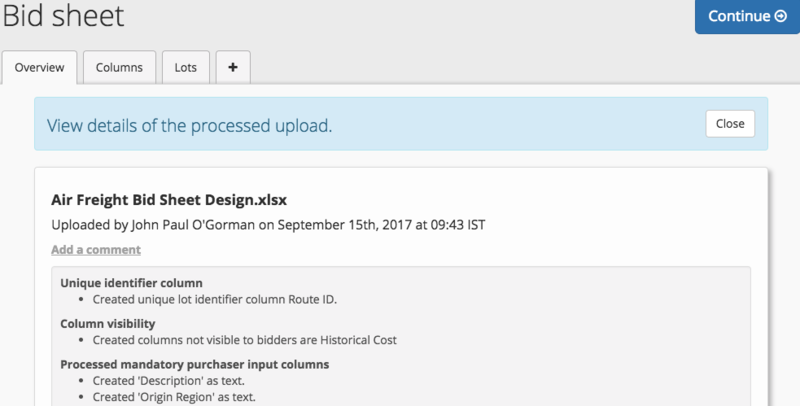 You can replace an uploaded bid sheet design with updated information that's imported by simply dragging the new bid sheet to the upload area, rather than making the changes online. To summarizing different stages, see animation 1.0 below. Animation 1.0: The bid sheet design upload flow. The purchaser, for information you’re providing to the carriers. The purchaser with bidder-specific values (e.g., you would use the 'Starting Bids' screen to enter a value of '100' for Supplier A and a value of '80' for Supplier B). Bidder, for information they need to provide. Mandatory – the user cannot leave this column null/empty. Optional – the column can be left null/empty. Restricted values: Create a drop-down list by entering values separated by commas (e.g., 30 days, 45 days, 60 days, 90 days). Bidder visible: Either visible or not visible (hidden), meaning that the column won’t appear on the bidder side. Specify the number of decimal places using the drop-down box under 'Input type'. Restricted values: Create a drop-down list by entering numbers separated by commas (e.g., 1, 100, 1000). Minimum value: Enter the minimum acceptable value. Maximum value: Enter the maximum acceptable value. The other options are the same as for Text columns. The default is 2 decimal places. All the other basic options are the same as for Number, such as the ability to restrict input values. See the section below for information about the ‘Show advanced options’ feature for Currency columns. When adding or editing currency columns, you’ll see ‘Show advanced options’ near the bottom of the pop-up window. This area lets you set the currency for purchaser-input fields. For bidder-input fields, specify whether the currency is set by the purchaser or bidder. If the currency is set by the purchaser, there’s a ‘Currency’ field you can use to select the currency for the column (based on the list you created on the ‘Overview’ subtask). If you need to start over and delete all column and row data, click the ‘Reset’ button and then click ‘Yes, reset’. You will be returned to a blank state and can then upload a file to start again.